It’s the 1970s, and Ron Stallworth (John David Washington) is the first African-American Detective to serve in the Colorado Springs Police Department. Determined to make a name for himself, Stallworth bravely sets out on a dangerous mission: infiltrate and expose the Ku Klux Klan. The young Detective soon recruits a more seasoned colleague, Flip Zimmerman (Adam Driver), into the undercover investigation of a lifetime. Together, they team up to take down the Extremist Hate Group as the organization aims to sanitize its violent rhetoric to appeal to The Mainstream. 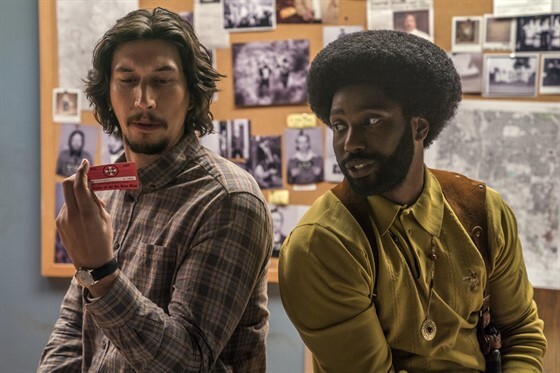 BlacKkKlansman is nominated for 6 Academy Awards: Best Picture, Best Director (Spike Lee), Best Supporting Actor (Adam Driver), Best Adapted Screenplay, Best Original Score, and Best Film Editing.